How to Cite This Chapter: Loeb M, Kuś J, Jankowski M. Hospital-Acquired Pneumonia. McMaster Textbook of Internal Medicine. Kraków: Medycyna Praktyczna. https://empendium.com/mcmtextbook/chapter/B31.II.3.11.2 Accessed April 23, 2019. National Clinical Guideline Centre (UK). Pneumonia: Diagnosis and Management of Community- and Hospital-Acquired Pneumonia in Adults. London: National Institute for Health and Care Excellence (UK); 2014 Dec. PubMed PMID: 25520986. 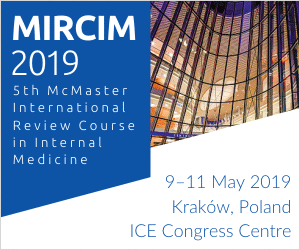 Woodhead M, Blasi F, Ewig S, et al; Joint Taskforce of the European Respiratory Society and European Society for Clinical Microbiology and Infectious Diseases. Guidelines for the management of adult lower respiratory tract infections--summary. Clin Microbiol Infect. 2011 Nov;17 Suppl 6:1-24. doi: 10.1111/j.1469-0691.2011.03602.x. PubMed PMID: 21951384. Limper AH, Knox KS, Sarosi GA, et al; American Thoracic Society Fungal Working Group. An official American Thoracic Society statement: Treatment of fungal infections in adult pulmonary and critical care patients. Am J Respir Crit Care Med. 2011 Jan 1;183(1):96-128. doi: 10.1164/rccm.2008-740ST. PubMed PMID: 21193785. Lim WS, Baudouin SV, George RC, et al; Pneumonia Guidelines Committee of the BTS Standards of Care Committee. BTS guidelines for the management of community acquired pneumonia in adults: update 2009. Thorax. 2009 Oct;64 Suppl 3:iii1-55. doi: 10.1136/thx.2009.121434. PubMed PMID: 19783532. Torres A, Ewig S, Lode H, Carlet J; European HAP working group. Defining, treating and preventing hospital acquired pneumonia: European perspective. Intensive Care Med. 2009 Jan;35(1):9-29. doi: 10.1007/s00134-008-1336-9. PubMed PMID: 18989656. Mandell LA, Wunderink RG, Anzueto A, et al; Infectious Diseases Society of America; American Thoracic Society. Infectious Diseases Society of America/American Thoracic Society consensus guidelines on the management of community-acquired pneumonia in adults. Clin Infect Dis. 2007 Mar 1;44 Suppl 2:S27-72. PubMed PMID: 17278083. American Thoracic Society; Infectious Diseases Society of America. Guidelines for the management of adults with hospital-acquired, ventilator-associated, and healthcare-associated pneumonia. Am J Respir Crit Care Med. 2005 Feb 15;171(4):388-416. PubMed PMID: 15699079. Hospital-acquired pneumonia (HAP) is a pneumonia that develops after 48 hours of hospitalization in a patient who has not been intubated on admission. Ventilator-associated pneumonia (VAP) is a pneumonia that develops after >48 hours of starting mechanical ventilation. Health-care–associated pneumonia (HCAP) is a pneumonia developing in patients who were hospitalized for ≥2 days within 90 days prior to the onset of the infection; residents of long-term care facilities; patients who received intravenous antibiotics, chemotherapy, or wound treatment within 30 days prior to the current infection; or patients who attended a hospital or hemodialysis clinic. 1) Within the first 4 days of admission etiologic agents may be the same as in the case of community-acquired pneumonia (CAP) and may also include gram-negative bacilli (Escherichia coli, Klebsiella pneumoniae, Enterobacter spp, Proteus spp, and Serratia spp). 2) From day 5 onwards etiologic agents are more likely to include multidrug-resistant strains, typically aerobic gram-negative bacilli: Pseudomonas aeruginosa, E coli, K pneumoniae, Acinetobacter spp, and more rarely Legionella pneumophila. The predominant gram-positive bacterium is Staphylococcus aureus, whose hospital strains may be methicillin-resistant. The sources of pathogens are medical devices and the environment (air, water, equipment, clothing), but the pathogens can be also transmitted between the patient and the medical personnel or other patients. Clinical features are the same as in CAP (see Community-Acquired Pneumonia). Mortality rates in patients with HAP developing after surgery are ~20%. In patients treated in the intensive care unit, the mortality rates are 30% to 40%. Diagnostic tests are the same as in CAP (see Community-Acquired Pneumonia). Prior to any modification of antimicrobial treatment in patients with suspected HAP, collect samples from the lower respiratory tract material (obtained by endotracheal aspiration, bronchoalveolar lavage, or protected specimen brushing). Blood cultures should be performed in all patients with suspected VAP; a positive result may be indicative of pneumonia or an extrapulmonary infection. Complications of an underlying condition, such as pulmonary embolism and pulmonary infarct (resulting from immobilization and deep vein thrombosis), sepsis (may be complicated by acute respiratory distress syndrome), or alveolar bleeding in the course of a systemic disease. Management of patients with HAP, VAP, and HCAP is similar. General measures are as in CAP (see Community-Acquired Pneumonia). Selection and dosage of antimicrobial agents: Table 2 in Community-Acquired Pneumonia. Management algorithm: Figure 1. 1) Patients hospitalized for <5 days without risk factors of drug resistance: Treatment with one antibiotic: ceftriaxone, fluoroquinolone, ampicillin/sulbactam, or ertapenem. c) A beta-lactam with beta-lactamase inhibitor (piperacillin + tazobactam, ticarcillin + clavulanic acid). 3) In patients with suspected L pneumophila infection, administer a fluoroquinolone (eg, levofloxacin) or a macrolide instead of an aminoglycoside. 4) In patients with methicillin-resistant Staphylococcus aureus (MRSA) risk factors, add vancomycin or linezolid. 2. After identifying the etiologic agent, switch to targeted therapy when indicated. The duration of combination treatment should be as short as possible (up to 7 days, except for P aeruginosa infections). If the antimicrobial agents used in the empiric treatment were appropriate for the pathogens, attempt to shorten the total duration of treatment from 14 to 21 days down to as little as 7 days provided a good clinical response is achieved (this does not apply to HAP caused by P aeruginosa). In patients with pneumonia caused by P aeruginosa, combination treatment is used. In patients with Acinetobacter spp infection, use carbapenems, ampicillin + sulbactam, or colistin. In patients suspected to have infections caused by Enterobacteriaceae producing extended-spectrum beta-lactamase (ESBL), carbapenems are recommended. 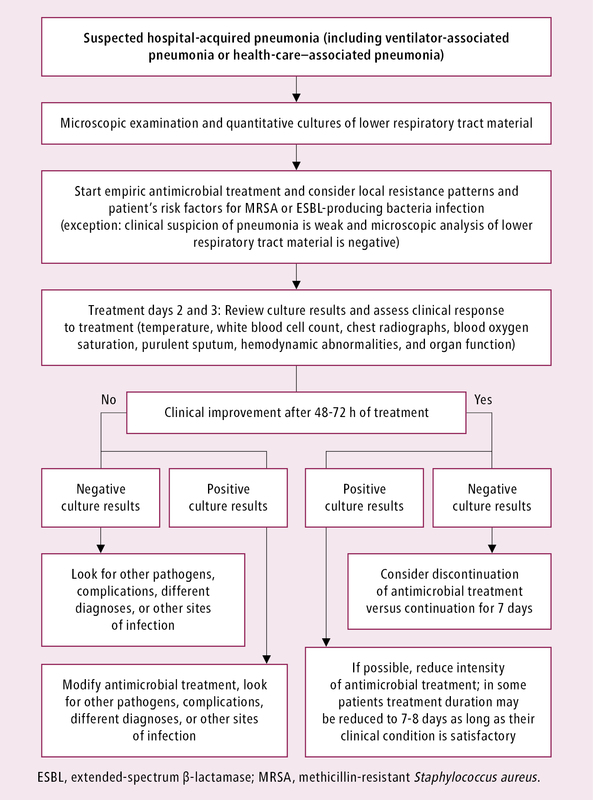 Assess the clinical response to antimicrobial treatment after 48 to 72 hours. Resolution of fever, a decrease in white blood cell counts, an increase in blood oxygen saturation, and an improved general condition confirm the effectiveness of treatment. If no improvement is observed, repeat microbiological tests and consider a different etiology (mycobacterial or fungal) or diagnoses other than pneumonia. Figure 1. Management algorithm in patients with suspected hospital-acquired pneumonia.